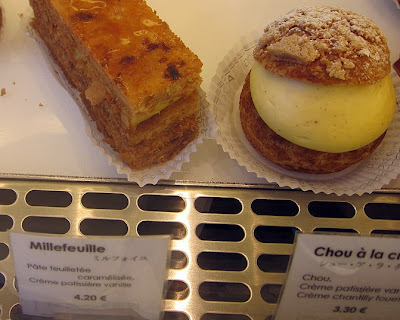 paris breakfasts: The New Choux! Another French pastry lecon today deconstructing the basic creme puff or French choux. Sharpen your pencils svp. Everyone knows the traditional French croquembouche wedding cake - a tower of choux pastry filled with chantilly whipped creme, then dribbled with molten caramel. Here a mini version minus wedding, obligatory hat and gloves. Indulge yourself! What is the religieuse but a double-decker stack of choux? La Maison du Chocolat helps you out with a nice pastry cross section view of the innerds. 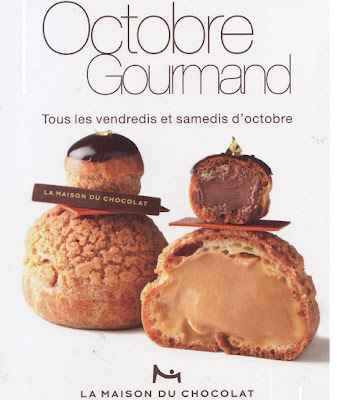 Not so helpful since you can only buy these on Fridays/ Saturdays in October in Paris. I missed out. 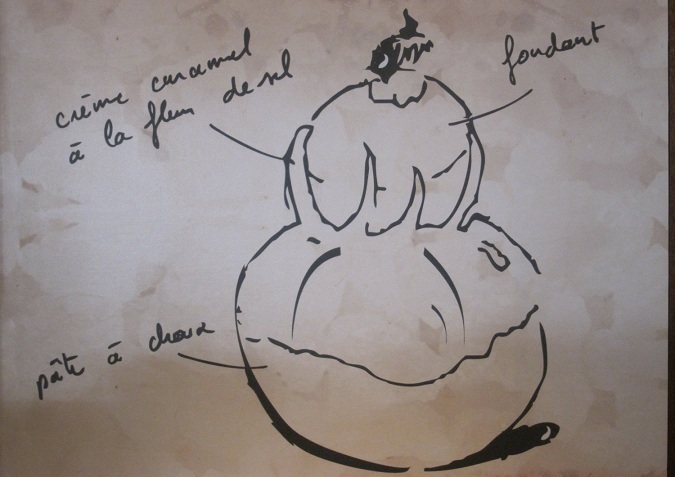 I loved this informative drawing on the walls of new patisserie Sebastien Degardin. If you buy a how-to eclair book you can also make choux - same pastry. 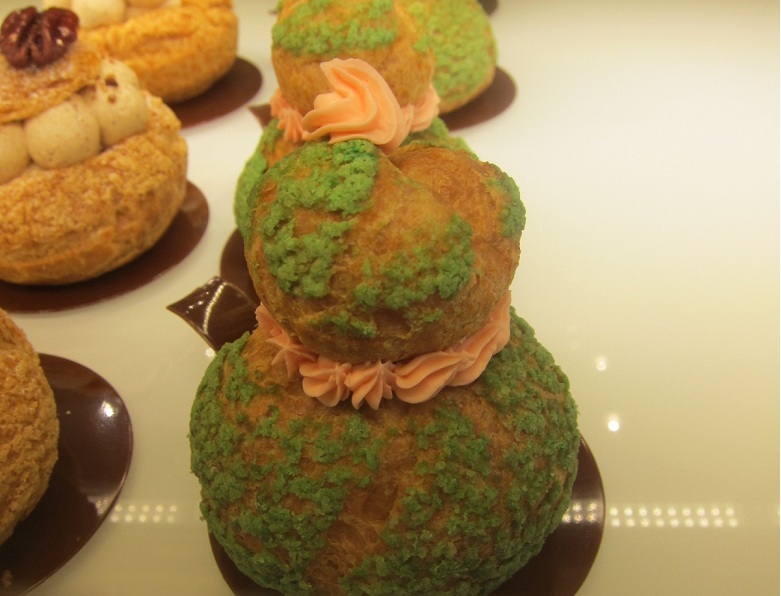 Sadaharu Aoki deconstructs the creme puff by slicing in half and exposing a naughty chou a la creme. 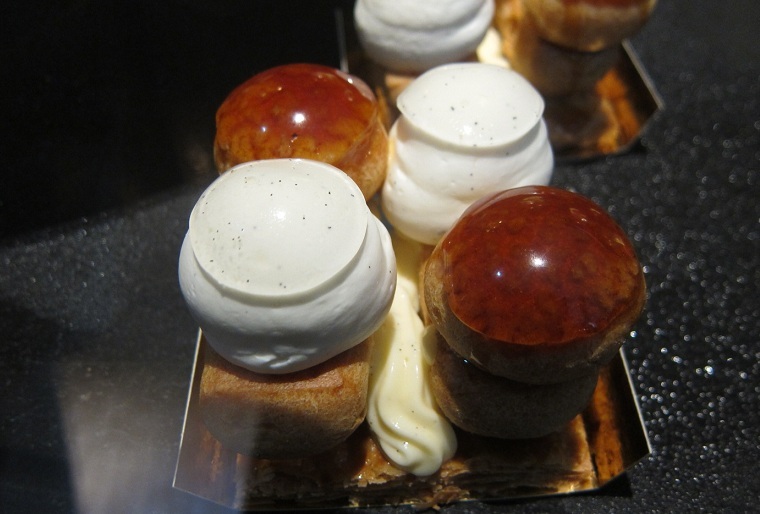 Another new patisserie, Cyril Lignac gives the religieuse a modern twist. Angelina makes the religieuse's pate a chou crustillant, a newish pastry look = crusty, crunchy texture. Angelina has a book out showing the revisited Saint-Honore - more choux innovation. 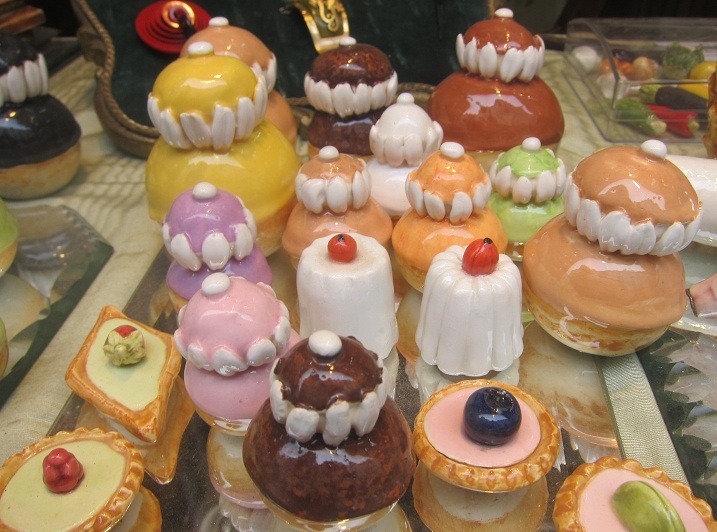 At hotel Mandarin Oriental pastry counter a Saint-Honore of creme puffs de-stacked (8 euros). Their trio de choux(8 euros) - some say the choux is the new macaron. What do you think? 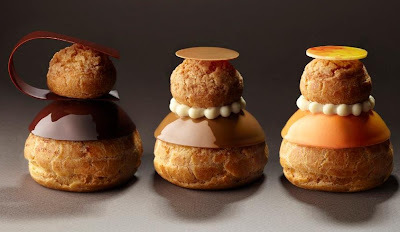 Some choux you don't want to bite into! Candles. 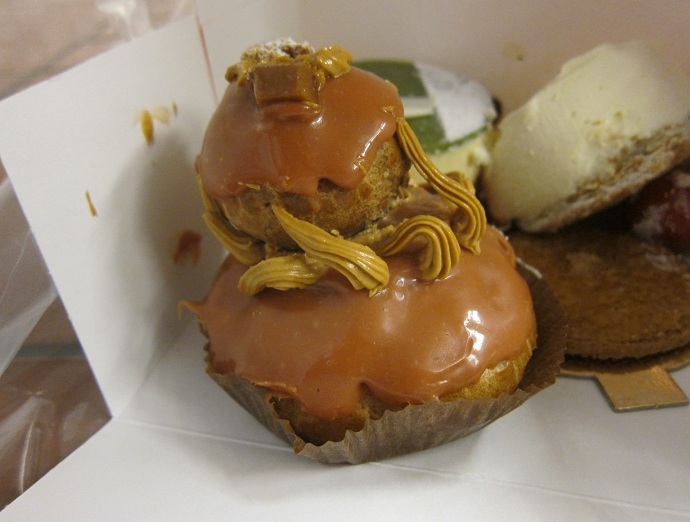 Choux/religieuse do NOT travel well. Avoid the Metro and order a limo for gawds sake. 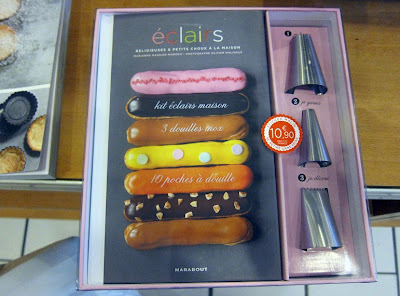 Loving these pastry lecons especially for breakfast. *slurp*...um, 'scuse-moi. That was delish. 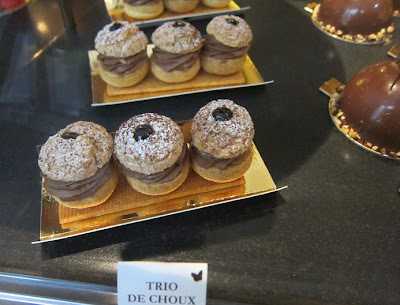 I've always loved that they call those double-decker choux "religieuse" - like it's a religious experience to eat one. If there are no nuts in the choux, then I say yes, they are the new macarons! 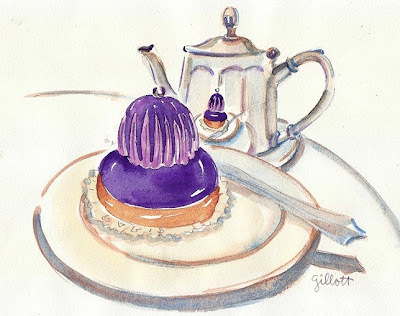 As a deeply dedicated reader of your blog, I want you to know just how much work goes into READING it: long ago, I learned to get prepared when I found that tantalizing PBS email in my inbox, finding a little sweet, brewing a cup of coffee to tide me over while I read. I soon learned that it would make sense to put ALL my sweets,cookies,chocolate, cake into a double locked cabinet to avoid that PB-induced sugar/butter frenzy which inevitably followed my reading. And now I have to add a new item to my PB prep list: sharpen my pencil! :-). One day soon, I will be spending more time preparing to read than it takes me to actually read! 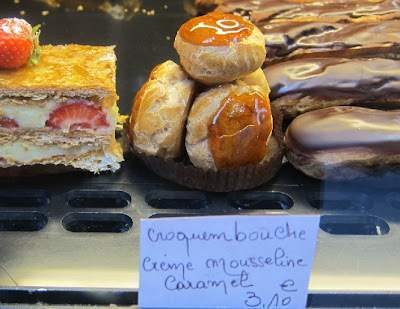 The choux can never be the next Mac. The choux lacks mystery- even little kids are familiar with cream puffs,eclairs and the savory cheese puff. No, the Mac will always be that mysterious, exotic tantalizingly unobtainable grail! 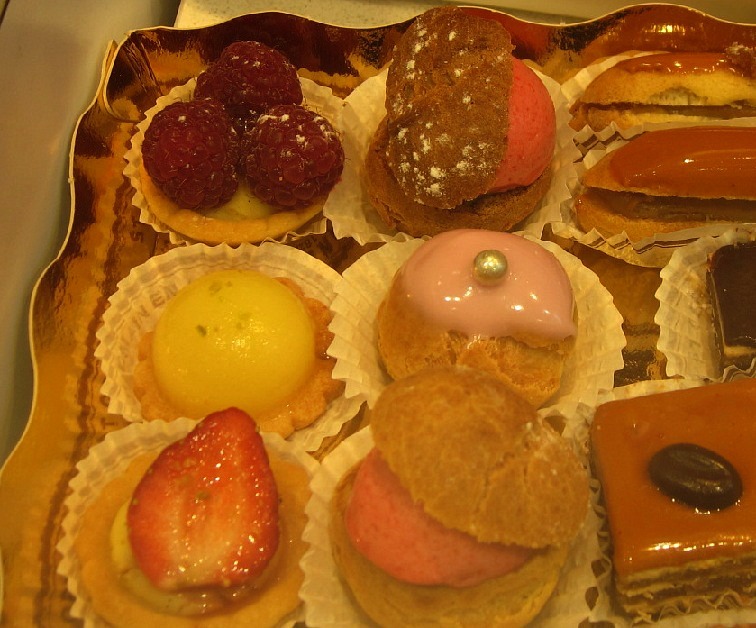 Besides, ANYone can make perfect choux paste on the very first try! 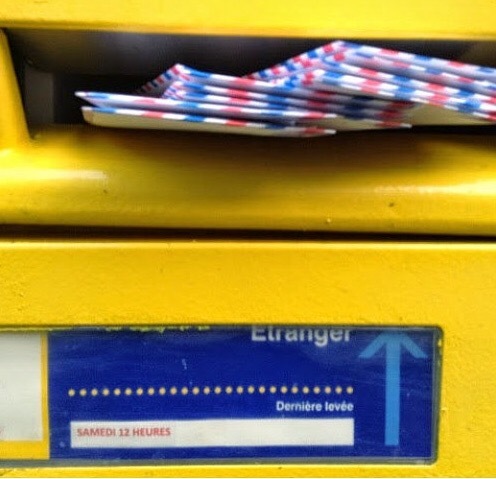 Vibe le macaron! Hey wait just a minute! 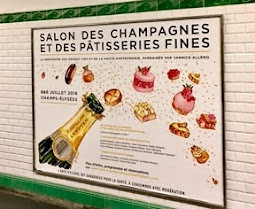 What's this about the bride at a French wedding wearing Chantilly lace getting covered in whipped creme that is then dribbled with molten caramel and all the guests are expected to indulge themselves? Can ANYONE make a choux pastry Jeanette? Hmmmm...pate a chou for thought. 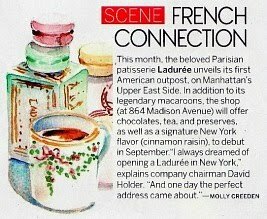 I agree btw that the macaron has it hands down over the chou but there must be something new all the time in pastry like fashion. 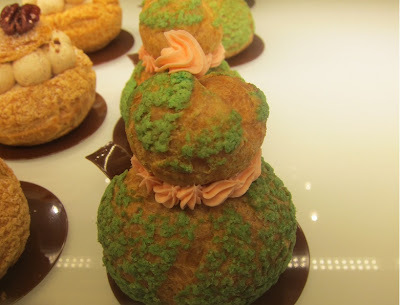 considering what nice green choux you have, I'm not surprised at your enthusiasm. The religieuse is called that because of it looks like a nun or some such story..
You've gotten carried away again. Nothing for it. 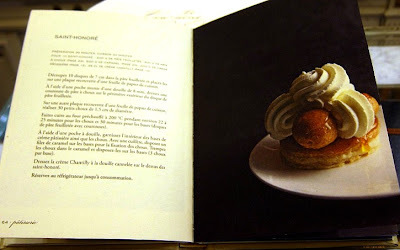 there are precautions to take with choux as well, like when adding the eggs & the cooling down so they don't collapse. Otherwise not so finicky as the elite The religieuse is fun to decorate, like Carol's purple one ( I love the tiny little reflection in the pot), but most real nuns not in the habit of being so colorful. 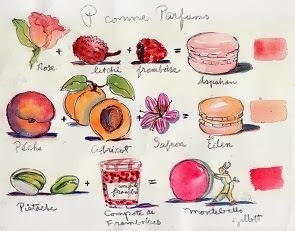 As the macaron. My iPad eliminates words & changes perfectly acceptable mis-spellings into gibberish! Ack!!!! They look great - especially the chocolate covered ones! 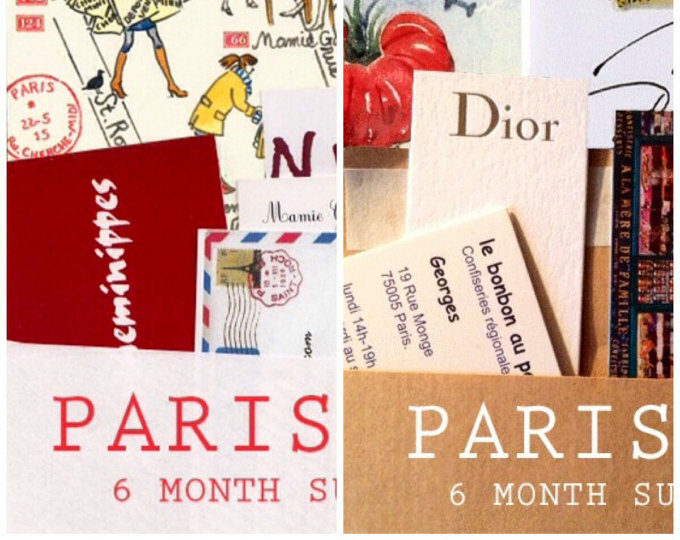 I love to read your blog I learn something new all the time! 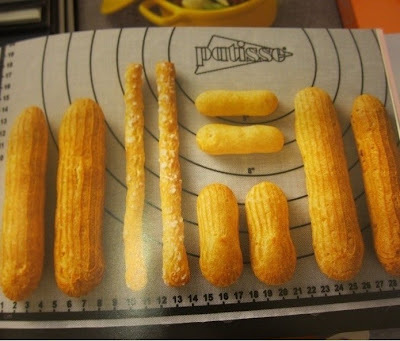 It all looks delicious!! That mini-wedding-cake is really something!